Whether you like your New Year’s libations toasty or chilled, we’ve got cocktails covered. 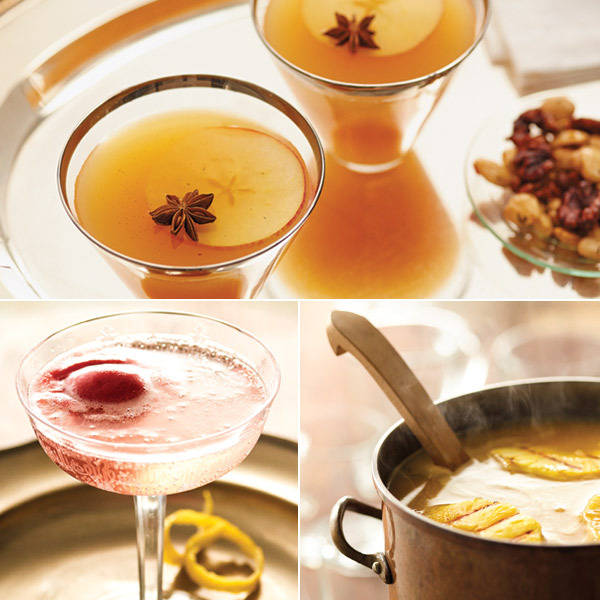 Just choose a cocktail recipe from our eight creative concoctions to mix up some New Year’s cheer! Pomegranate seeds add a holly-berry touch to this festive mulled wine punch recipe. Pomegranate, pineapple and orange juice turn up the fruity flavor, while cinnamon sticks and cloves add just-right spice. Bits of dark chocolate, half-and-half and milk create a rich hot chocolate. A splash of honey liqueur in each cup makes this hot cocoa recipe a cheers-worthy cocktail choice that’s extra warm and cozy. Your guests will gather ’round for a steaming mug of this hot rum punch topped with a grilled pineapple ring. Made with dark rum, a variety of juices, pumpkin puree and spices, this deliciously different cocktail is destined to become a New Year’s Eve party star. Add a little kick to your espresso with this cocktail recipe featuring your choice of liqueurs or flavored syrup. Serve this eye-opening libation to extend the New Year’s revelry—or at least to ensure that you don’t miss out on the countdown to midnight! Rosemary creates the evergreen flavor in this sparkly wine spritzer. Simple and festive, this cocktail recipe calls for Lillet aperitif, Campari liqueur, soda water, juice from an orange and dry sparkling wine. Whether you are toasting New Year’s or some other holiday or occasion, this sparkly rum cocktail is worthy of the celebration. So go ahead. Mix up some merry. Mix, shake and sip your way to spiced-apple goodness. Our Appletini recipe uses star anise cloves and vanilla bean seeds to provide an unexpected sweet and aromatic flavor. Nothing says “Happy New Year!” quite like champagne. Delight your taste buds—and your party guests— with this bubbly, fruity frozen cocktail treat. Tina Stamos is a food stylist who lives in Austin, Texas. When she makes it out of the kitchen, she likes to explore Texas, eat tacos from food trucks and teach her dogs how to play Frisbee.